Adult female - aggressive mood. Adult male - aggressive mood. Adult pair - aggressive mood. Adult male - neutral mood. Described from the Río Ucayali drainage in Genaro/Jenaro Herrera District, Requena Province, Loreto Region, northern Peru and also known from the Río Tahuayo further north, after the Ucayali’s confluence with the Río Maranón. A variant from the Río Tamshiyacu, which lies more-or-less adjacent to the Tahuayo, may or may not represent the same species (see ‘notes’). Tends to inhabit slower-moving tributaries, backwaters and creeks in areas where fallen leaf litter collects. Base dimensions of 60 ∗ 30 cm or more are acceptable for a single pair with a group requiring larger quarters. Provided adequate cover and structure is available this species is unfussy with regards to décor with ceramic flowerpots, lengths of plastic piping and other artificial materials all useful additions. A more natural-looking arrangement might consist of a soft, sandy substrate with wood roots and branches placed such a way that plenty of shady spots and caves are formed. The addition of dried leaf litter (beech, oak or Ketapang almond leaves are all suitable) would further emphasise the natural feel and with it bring the growth of beneficial microbe colonies as decomposition occurs. These can provide a valuable secondary food source for fry, while the tannins and other chemicals released by the decaying leaves aid in simulation of naturalistic conditions. Leaves can be left in the tank to break down fully or removed and replaced every few weeks. A net bag filled with aquarium-safe peat can also be added to the filter or suspended over the edge of the tank. Fairly dim lighting is recommended and plant species from genera such as Microsorum, Taxiphyllum, Cryptocoryne and Anubias are best since they will grow under such conditions. A few patches of floating vegetation to diffuse the light even further may also prove effective. Filtration, or at least water flow, should not be very strong and very large water changes are best avoided with 10-15% weekly adequate provided the tank is lightly-stocked. 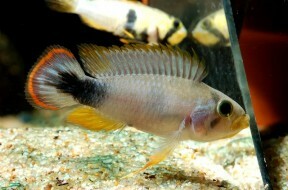 Apistogramma spp. are chiefly carnivorous and feed mostly on benthic invertebrates in nature. In the aquarium live and frozen foods such as Artemia, Daphnia and chironomid larvae (bloodworm) should be offered regularly although most species will also learn to accept dried alternatives with pelleted products generally preferred to flake. Captive-raised fish are the recommended choice for the general community aquarium. 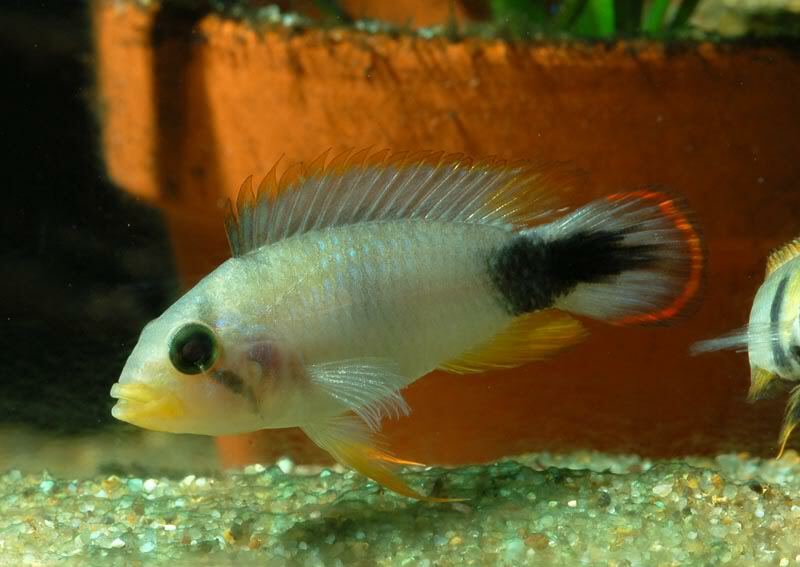 Wild examples are best maintained alone or with small ‘dither’ fishes such as Nannostomus or Micropoecilia spp., and ideally should not be mixed with other Apistogramma. It can be quite aggressive towards conspecifics and a very large tank would be needed to house a group, moreover once pairs form they often remain monogamous meaning there is no need to maintain a harem of females alongside a male. Males are larger, more colourful and develop more extended fins than females. Substrate spawner which normally lays its eggs in crevices or cavities among the décor. The female is responsible for post-spawning care of eggs and fry and in smaller aquaria the male may need to be removed as she may become hyper-aggressive. 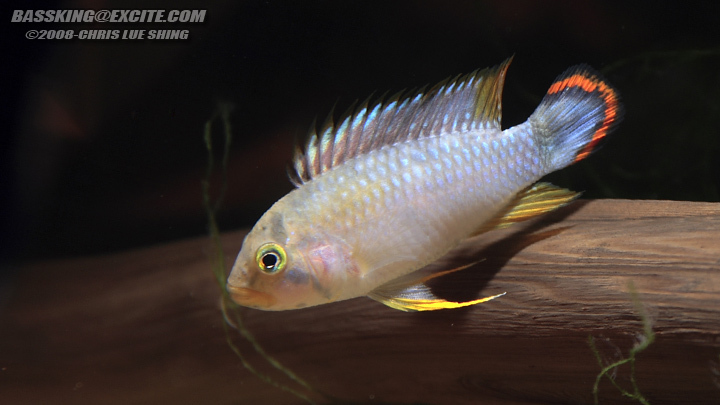 This species is also known by the alternative vernacular names ‘blue panda cichlid’, ‘blue sky dwarf cichlid and ‘azure cichlid’ as well as the confusing trade name A. sp. ‘pandurini’. It has also been assigned the ‘A’ number A183 under the DATZ system with a possibly conspecific variant from the Río Tamshiyacu coded A184. It can be distinguished from similar-looking species by the length of the lower jaw which characteristically extends beyond the upper. The genus Apistogramma is among the most speciose of South American cichlid genera with around 70 species valid at present but many more awaiting description. In addition many species exist in two or more geographical colour forms which may or may not turn out to be distinct in the future. Hobbyists tend to label these with collection data if available in order to avoid mixing them and the potential of hybridisation. Member species have also been organised into a series of species lineages, complexes and groups by authors in order to better separate them. Such lists have been augmented by fish that have appeared in the aquarium trade and are in a state of near-constant flux. For example the A. nijsseni group, of which A. panduro is a member, is contained within the A. trifasciata sublineage of the larger A. trifasciata lineage alongside A. arua plus the A. brevis, A. cacatuoides, A. atahualpa and A. trifasciata groups. 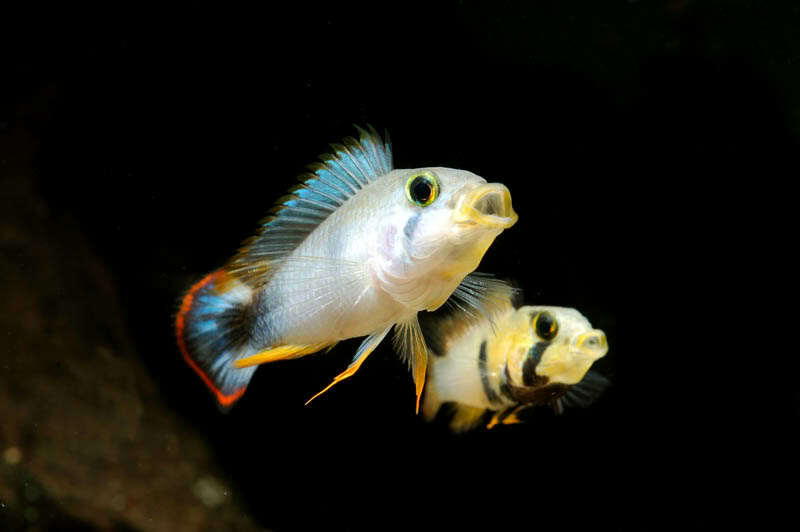 – a well-supported “Satanoperca clade” comprising Satanoperca, Apistogramma, Apistogrammoides and Taeniacara. – a “big clade” with Geophagus, Mikrogeophagus, ‘Geophagus‘ brasiliensis group, ‘Geophagus‘ steindachneri group, Gymnogeophagus, Biotodoma, Crenicara and Dicrossus. – a “crenicarine clade” with Biotoecus and Crenicichla. 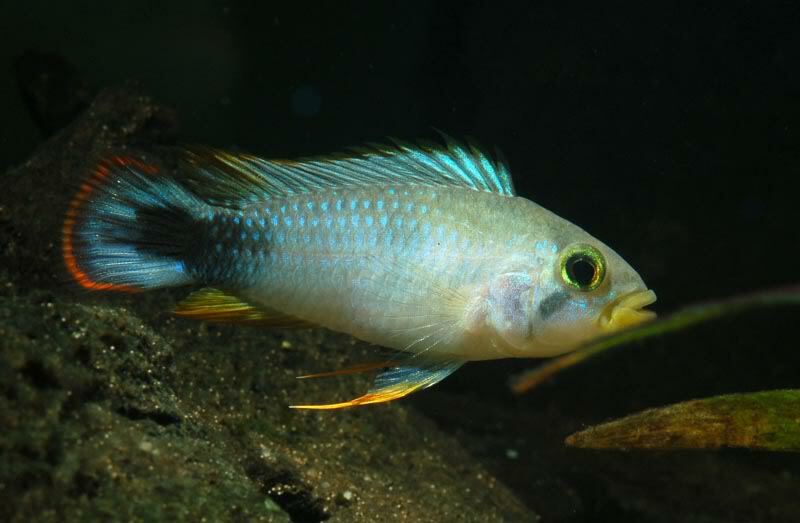 No representatives of Teleocichla or Mazarunia were included in the study but the former is well-established as sister to Crenicichla while the latter has grouped closely with Dicrossus and Crenicara in earlier works. The other main conclusions of the paper are confirmation that Geophaginae is a monophyletic group exhibiting strong signs of having undergone rapid adaptive radiation (diversification of a species or single ancestral type into several forms that are each adaptively specialised to a specific environmental niche). Kullander, S. O. 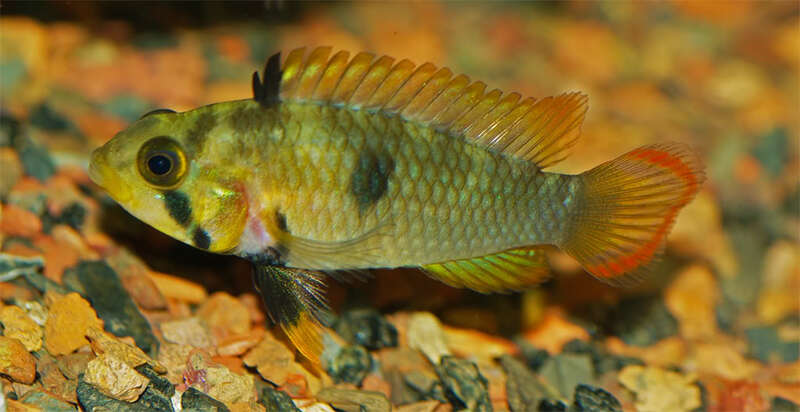 1986 - Department of Vertebrate Zoology, Research Division, Swedish Museum of Natural History, Stockholm, Sweden, 394 p.
Cichlid fishes of the Amazon River drainage of Peru. 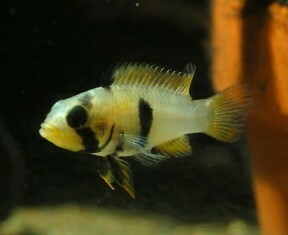 Cichlidae (Cichlids). In R.E. Reis, S.O. Kullander and C.J. Ferraris, Jr. (eds.) Checklist of the Freshwater Fishes of South and Central America. Römer, U. 2006 - Mergus Verlag GmBH, Melle, Germany. 1320 p.